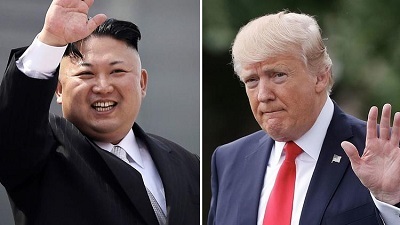 North Korean leader Kim Jong Un and President Trump © Wong Maye-E, Pablo Martinez Monsivais / Associated Press). Let’s start with the general observation about nuclear weapons. Ultimately they will either be abolished — as a United Nations agreement supported by 120 member nations calls for — or they’ll inevitably proliferate. If anything, it’s rather remarkable that they haven’t spread further already; but in addition to the original nuclear Great Powers, nuclear-armed states now include India and Pakistan as well as Israel, and now DPRK (North Korea). South Africa under apartheid had a secret nuclear weapons program — in collaboration with Israel — but renounced it in the 1990s when the African National Congress took power. If Donald Trump carries through on his idiotic threats to blow up the P5+1 (the five permanent UN Security Council members, plus Germany) deal with Iran, that regime might undertake its own rush toward developing nuclear weapons capability. That would likely soon be followed by Saudi Arabia and probably others. Which potential confrontation is really the most dangerous? None of us know, and we don’t want to find out the hard way. Moving to today’s immediate crisis, it’s true that the North Korean regime is in the running for the world’s most brutal. It’s a nationalist autarky flying a “Communist” flag of regional convenience, its ruling military-political elite headed by a family dynasty, where much of the population periodically starves and internal purges are carried out by liquidating the victims with anti-aircraft weaponry. But that is not the fundamental reason why North Korea is pursuing what its rulers rather grandly call “strategic nuclear equilibrium” with the world’s greatest superpower. Kim Jong-un’s ego may play a role, but that’s not the decisive factor either — any more than Donald Trump’s serious personality disorders are the driving force of U.S. imperialism. We need to remind ourselves that the horrible Korean War of the late 1940s and early ‘50s never formally ended. The truce that ended the fighting in 1953, after much of the country was destroyed and the U.S. and Chinese militaries had fought to a bloody draw, left tens of thousands of U.S. troops stationed in South Korea. The U.S. presence remains a threat both to North Korea and China, and needs to be removed! More recently, the North Korean leadership sees the examples of Muammar Qaddafi in Libya and Saddam Hussein Iraq – both of whom had been on friendly terms with Western governments and intelligence services — who gave up their plans to develop nuclear weapons capability, and got whacked when the imperial godfathers found it expedient to dump them. These have been promoted as “victories” for righteous American power. In fact, they are a warning to small countries they’d better develop some kind of “asymmetric” retaliatory capability. Since North Korea has always been on the U.S. official enemies list (remember George W. Bush’s “axis of evil“), all the more reason then for its regime to seek strategic deterrence. Its massive artillery has been aimed for decades at Seoul, the capital and heart of South Korea, in a game of Mutual Assured Destruction on the peninsula. But what North Koreans also remember, although Americans long ago forgot, is that during the Korean War the United States bombed the place to smithereens until there were no military targets left, then bombed North Korea’s dikes — so the regime has long sought a strategic balance of terror against the U.S. itself. With the protection of its ally China no longer assured, now that China has strong economic relations with South Korea, the United States and the West in general, Pyongyang has gone for the ultimate nuclear option. That might well prove to be a suicidal choice, but it has its own insane logic within the larger massive insanity of a global system on the edge of self-destruction. Where does this leave us? In the complex crosscurrents of regional and global geopolitics, the South Korean government (fortunately) opposes the stationing of U.S. nuclear weapons on its territory. The majority of the South Korean population is antiwar — understandably not wishing to be potentially vaporized in a holocaust brought on by outside powers. The newly elected South Korean president Moon Jae-in is looking for openings for de-escalation and dialogue, and has allocated $8 million for aid (to be distributed through UNICEF) to children facing starvation in the North. This is both a humanitarian and political gesture, opposed by the United States whose policy is to draw South Korea into Washington’s increasingly confrontational stance. China and Russia are trying to ratchet up economic and diplomatic pressure on North Korea to freeze its bomb and ballistic missile tests, while also calling for the United States and other powers to de-escalate and engage in negotiations with the North. None of these regimes are in any way progressive, but in one way or another, negotiations are the only actual alternative to a slide toward catastrophe. There’s no need to have any illusions about North Korea in order to recognize the importance of demanding “no war” and dismantling the U.S. military presence. We, the people of the United States, have no “place at the table” or any means of shaping the terms of negotiations. We do have our voices, and we need to use them. We have to tell the Congress and our fellow Americans that we’re not only sick of Donald Trump’s antics and border walls and white supremacy, but we’re sick of the endless wars that Democrats and Republicans alike are continuing in Afghanistan and Iraq and Syria and Yemen, the ever-growing military budget that’s eating us alive, and climate change denial that threatens to end human civilization even without nuclear war. The $700 billion U.S. military budget passed the Senate by a vote of 89-8. (If that’s bipartisanship, can we please have our gridlock back?) Is there a bigger waste of money right now, at a time when Houston, Florida, Puerto Rico and the U.S. Virgin Islands need to be rebuilt — as well as all the Caribbean nations pulverized by nature’s message about what climate chaos is bringing? We need to recognize that among all the retrograde and reactionary regimes at play in this crisis, the government of our own imperialist state is the most dangerous. It’s a threat not only to North Korea but to our survival. No Trump, no war, no way! For further reading at International Viewpoint see Tadashi Kinoshita’s Before building peaceful workers’ state in the Korean Peninsula. Among the U.S. groups organizing against the war drive, we recommend the initiatives of CodePink.